Whether guests are seeking a convenient location for corporate travel and conventions or a spot for a weekend getaway, they will enjoy the warm hospitality of our staff and the comfort of luxurious accommodations. Guestroom amenities include FREE wireless internet, work desk, coffee makers, irons and ironing boards, and hairdryers. For those seeking upgraded amenities, our executive concierge level rooms provide extra touches such as complimentary breakfast, evening hors d*oeuvres (Sun-Thurs) and nightly turndown service. Home to Chisholm's American Beef and Ale House, Wichita's premier beefcentric restaurant. Enjoy breakfast, lunch or dinner in an elegant relaxed setting. Chisholm's features 24 beers on tap as well as wine wall which holds over 1,000 bottles comprised of 150 different labels. 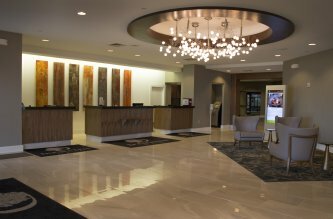 The DoubleTree by Hilton Wichita Airport is located in west Wichita across the street from Dwight D. Eisenhower National Airport.